Fried breaded chicken breast with a curry sauce and sticky rice. Fried breaded chicken with a curry sauce and sticky rice. 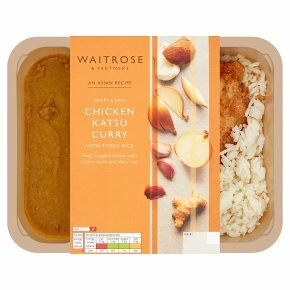 INGREDIENTS: Cooked rice (46%) (water, long grain rice, rapeseed oil, pandan leaf, salt, whole lime leaf), chicken breast (20%), water, fortified wheat flour (wheat flour, calcium carbonate, iron, niacin, thiamin), rapeseed oil, onion, coconut extract, garlic purée, sugar, apple purée, ginger purée, desiccated coconut, cornflour, chicken extract, tomato purée, salt, coriander, turmeric, yeast, wheat gluten, mustard flour, lemon juice, chilli powder, cumin, fenugreek, rice flour, fermented soya bean, wheat, white pepper, ground ginger, fennel, paprika, nutmeg, cane molasses.